I’ve always heard about the “Empty Nest Syndrome”, (when your kids leave home) but personally was looking forward to the freedom and renewal that would be mine once the kids were out on their own. Being divorced and having to support myself didn’t allow much time to think about being lonely , so as much as I love my 3 kids, it was great to be able to concentrate on ME! So what happens? During the time I’m finally able to start a new career, discover who I am as a person and pamper myself once in awhile, I start with the menopause symptoms! 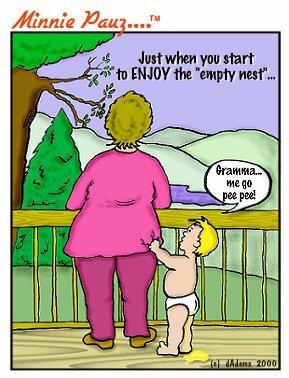 During the next 15 years of having an “empty nest”, I went through horrendous hot flashes, sleepless nights, a debilitating depression brought on by an accident, losing my job and my car, instead of the rewarding time I was expecting. Just about the time that I started coming out of the depression and becoming post-menopausal, the kids start having babies. So once again, there was an additional role to play and instead of being just a mother (you KNOW that NEVER stops), I also felt the responsibility and desire to be the best grandmother I could be. But I have still been on the search for MY life and sometimes feel that I was robbed of the chance to find myself during those “empty nest” years. Grandchildren are wonderful in a way that is difficult to explain. It’s different for each of us depending on our own life experiences and our current situations, but somehow a little guilt will probably enter into the equation. How do you explain “brain fog” or “mood swings” to your kids when they ask you to babysit for the weekend? You can only hope they are understanding enough when you tell them, “this is just not a good time”. Although the physical aspects of going through menopause can affect your relationships with loved ones, it’s equally as important to consider the mental part too. Remember that you’re entitled to this time in your life. If you need time to yourself , or want to take a vacation, or you are a business owner, or still working to make a living, or like me, trying to finally enjoy your “empty nest”, then DO IT! Create your lifestyle in your own fashion and take time to pamper yourself. Go back to school if that’s something you feel you missed out on. Take painting classes or piano lessons. You can even CHANGE YOUR MIND if you want to! However you decide to fill your empty nest, just know that this is a time for YOU and you deserve to be honored for the woman you have become. And do it right away because, before you know it, they'll probably be moving back in! !